Gold bullion and Crude Oil are both setting up for a rally higher if they continue to complete the breakouts. Oil looks like the best trade from a quick glance with huge profit potential but its important not to under estimate gold bullion as it can generate big moves even though is has already made a nice rally this year. 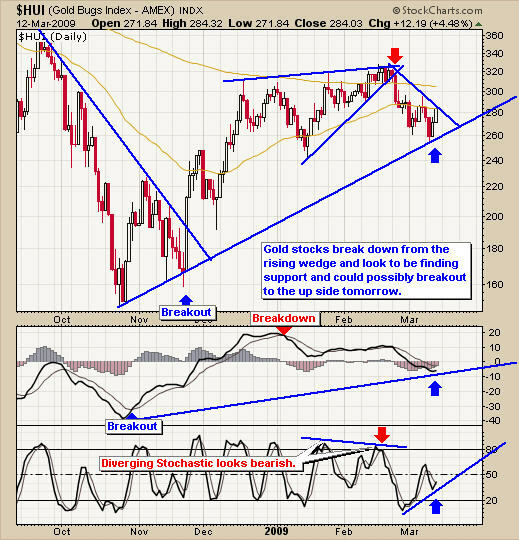 Gold stocks look to be finding support and are testing resistance levels from both our trend line and 50 EMA. A breakout to the up side would be very bullish for these golden investments. Gold bullion has had a great rally this year but it was tough to time entry points due to the V shaped bounces compared to consolidation style patterns. As you can see on the gold GLD chart below we are seeing a possible bounce which could be the beginning of a new leg higher. Crude oil futures are trading and trending higher and look to have some legs behind the move. Oil has been slowly trying to bottom and with any luck the next couple weeks we will see a full trend reversal and start to move higher. You can see from the chart below that the momentum (MACD) has been moving higher over the past few months and this kind of divergence is bullish for oil. In the past 2 weeks oil has broken an important resistance trend line. Things are starting to look up for oil. Crude oil is tough to trade because all the funds seem to have contango which alters the price of the fund several percentage points away from the actual price movements of crude oil futures contracts. The USO fund today has made a nice move higher with strong technicals. 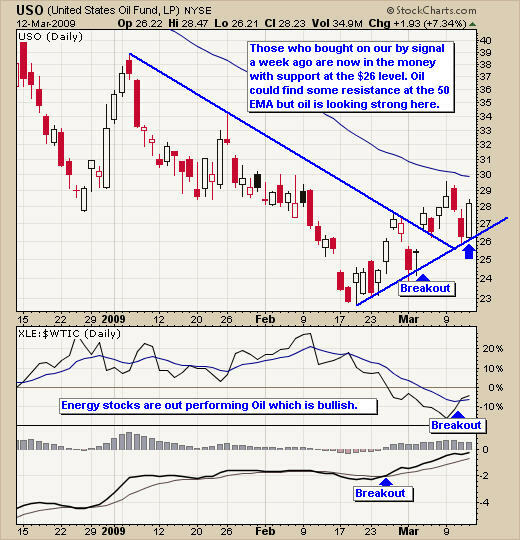 As you can see on the chart energy stocks are out performing oil which is very bullish. The momentum (MACD) is bullish as well. Oil could find some resistance at the 50 EMA but we will cross that bridge when we get there and hopefully Friday. I can reassess the situation over the weekend. Gold and oil are both looking very bullish as of today. The weekly chart of gold bullion although it is down for the week is currently testing the 10MA which is a technical support level and has held many times before when gold is trending higher. 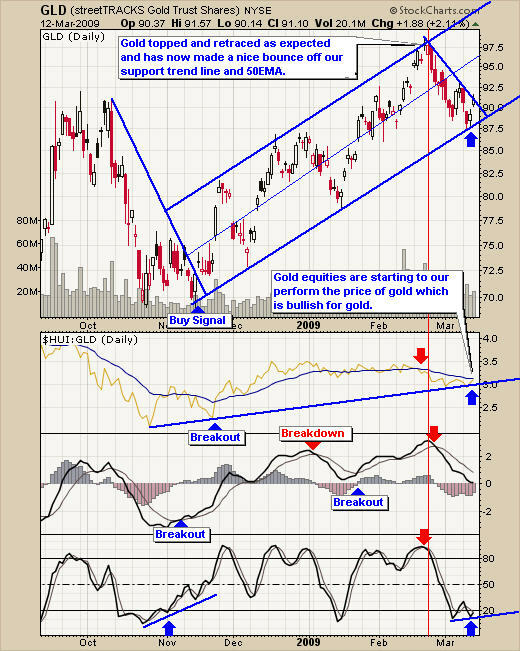 We would like to see a bounce in gold which would last several weeks or months. 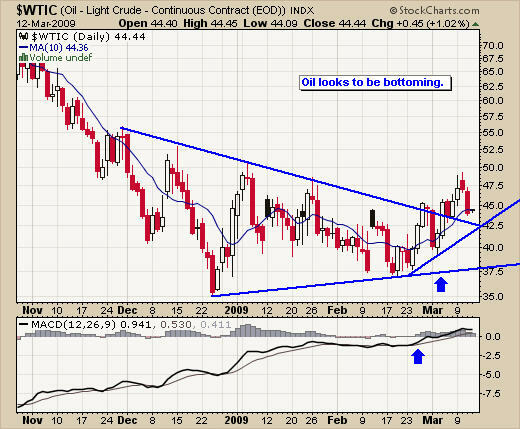 Crude oil has bullish charts as well but is the flip side of gold. Oil has been moving higher and has broken out to the up side with momentum (MACD) generating a breakout signal. The next few weeks could provide some great buy points for these commodities if the technical's hold up. Gold is currently at support which is generally a good buy point and oil is trading at the high but with a new trend line support drawn today it is trading near a possible support level. I just finished reading a book written by JT Grenough, about what you can do to protect yourself in this new world order economic environment. It's about crisis investing for 2009 covering gold, oil and real estate. Definitely worth reading! I have put together a Recession Special package for yearly subscribers which is if you join for a year ($299) I will send you $150 FREE in gas, merchandise or grocery vouchers FREE which work with all gas stations, all grocery stores and over 100 different retail outlets in USA & Canada. If you interested please act fast as I only have 67 of these vouchers before they are gone for good.